DeMarcus Cousins is an American professional basketball player who plays for the Golden State Warriors of the National Basketball Association (NBA). He played college basketball for the Kentucky Wildcats, where he was an All-American in 2010. He was named to the NBA All-Rookie First Team in his first season with the Kings. He was named an NBA All-Star from 2015 to 2018. 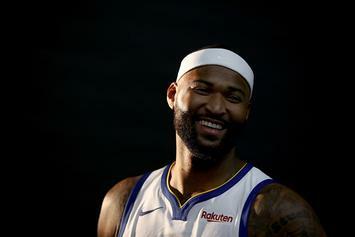 Cousins is also a two-time gold medal winner as a member of the US national team, winning his first in 2014 at the FIBA Basketball World Cup and his second in 2016 at the Rio Olympics. Born DeMarcus Amir Cousins on August 13, 1990 in Mobile, Alabama, to parents Monique and Jessie Cousins, his brother, Jaleel, played basketball at the University of South Florida. Cousins attended LeFlore Magnet High School. In 2018, Cousins became engaged to his Longtime Girlfriend Morgan Lang. *He was born on August 13, 1990 in Mobile, Alabama, USA. *In 2009, he was selected to the McDonald’s All-American team selection. *In 2009, he was selected to the Jordan Brand High School All-American team selection. *He was named the 2009–10 SEC Freshman of the Year. *He was selected with the fifth overall pick in the 2010 NBA draft by the Sacramento Kings. *He played basketball at the University of Kentucky with the Wildcats. *He was named the Rookie of the Month in July of 2010. *He signed with the Golden State Warriors in 2018.